Our original plan was buying all the furnitures like bed, kitchen, shelves and even shower booth from IKEA and B&Q. However, as I mentioned on a previous post, our particular brand van wasn't on our wish list. So everything we planned didn't work at all because it is bit shorter and lower. We are using it as a sofa at day and it could be transformed into double bed at night. It just perfectly fitted in our van. 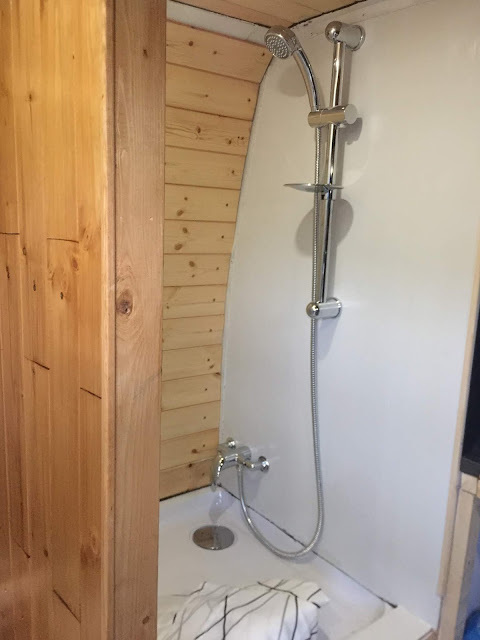 Making a bathroom / shower booth was the most difficult task to us because of the wheel arch. There are several providers making custom shower tray. But we can't afford it. So we decided to put a normal shower tray over a wheel arch and place a waste tank under it. I love cook. I've been cooking myself since I left home 10 years ago. And we didn't want to have weird camping foods. So we built fully equipped kitchen. Worktop, sink and tap from IKEA. It looks better than normal camper van kitchen kit.